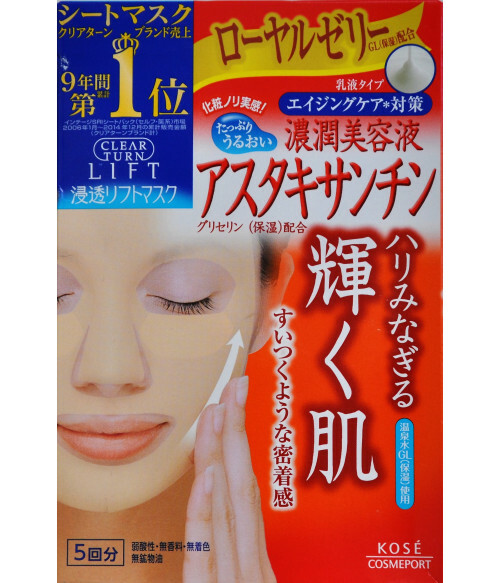 Lifting Mask contains astaxanthin, serine, water from mineral springs and complex Mimisaka of 12 plant extracts. It - concentrated care for face and eye area. Has long visible lifting effect - tightens facial contours, smoothes wrinkles. Natural substances, astaxanthin and serine have stimulating properties, reduced skin elasticity. It gives the skin moisture and shine. The mask is made of thick cotton nonwoven cloth "bemlize" basis. This - the nonwoven fiber derived from cotton linters, cotton seed coating. It does not irritate the skin, perfectly absorbs and tight to the skin, which is its feature. It is also well-biodegradable by making it environmentally friendly to the environment. Mask liberally soaked with concentrated cosmetic essence. Slightly acidic formulation without flavoring agents, colorants, alcohol and mineral oil. To express the lasting effect it is desirable to use a mask courses within 10-12 days of the week apart. Application: Remove the mask from the package, unfold and apply on the pre cleansed face. Hold for about 15 minutes. The remains of the mask with your fingertips type in the surface of the skin. Precautions: Remove from the packaging using a mask immediately. After tanning, use only in the event that redness and burning of the skin gone. Do not use too long and did not go to bed wearing a mask. Fabric does not dissolve in water, so do not throw it down the toilet. Do not store in the sun or in a high temperature place. Do not use if the skin has sores, boils, eczema and other problems. If, during the application appear redness, blisters, itching, irritation, etc., discontinue use and consult a dermatologist. In case of contact with eyes immediately rinse them. Ingredients: water, BG, glycerin, DPG, PEG-8, an extract of arnica, horsetail extract, yarrow extract Europe, ivy extract Europe, extract of horse chestnut, serine, witch hazel extract, grape leaves, hops, pine extract, saxifrage, lemon extract, rosemary extract water from a mineral source, astaxanthin, serine, EDTA-2Na, (acrylic acid / alkyl (S10-30)) - copolymer isostearate, PEG-50 hydrogenated castor oil, xanthan gum, trietilgeksanoin, sodium hydroxide, isobutylparaben, ethylparaben.